All Evolution models incorporate a Multiaxial Reinforced Mid-Section, 90 Ton Carbon Fiber, Maximum Fiber Content, MCT, and Phantium finish. 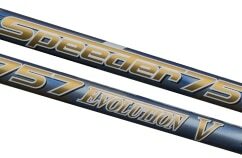 Additionally, Fujikura was the first performance shaft manufacturer to utilize T1100G. T1100G is both a high strength and high modulus premium material that enables Fujikura engineers to dial in the stiffness zones of the shaft without adding weight or sacrificing feel.